Des Brennan reports on the Royal Air Force Leuchars Airshow 2006, which took place the 9th of September, 2006. RAF Leuchars near St. Andrews in Fife, Scotland is an operational Royal Air Force station housing three Panavia Tornado F.3 units, a Gazelle AH.1 equipped Army Air Corps Flight and a University Air Squadron flying the Grob Tutor T.1. Leuchars has a history of airshows going back to the post-war Battle of Britain Open Day events and this years Airshow 2006, on Saturday 9th. September took place in gloriously warm, cloudless weather. Although the RAF did not present a Tornado F.3 solo display aircraft for the 2006 season the Leuchars F.3 units more than made up for the type's absence elsewhere with their aircraft very much in evidence both in the air and on the ground. 43 and 56 Squadrons celebrated their 90th. 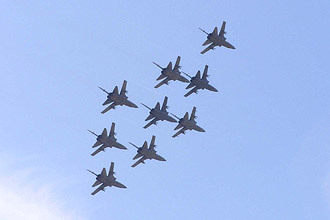 anniversary years with a formation routine including a Diamond Nine flypast. 111 Squadron. participated in an Tactical Display involving four F.3s in 2-v-2 combat including simulated ground-strafing runs until four Lossiemouth based Tornado GR.4 arrived amidst more pyrotechnics to neutralise opposition and allow an evacuation by Chinook HC2. Finally 56.Squadron. provided an F.3 for the traditional low, fast run marking the finale of the Sunset Ceremony and end of the show. In addition a large number of locally based aircraft were displayed on the ground. One notable absentee was 43. Squadron's all-black anniversary aircraft which one press report states was ordered out of public view by "Senior RAF Officers" because the colour scheme was unauthorised. As the aircraft had flown in the Diamond Nine practice two days earlier as broadcast on a national UK television programme and images of this were included on the Ministry of Defence website this decision may have struck some as being rather petty. While the show was very much a celebration of the Tornado F.3 a more sombre event was marked by the flypast of a single Nimrod MR.2 crewed from 120 Squadron from Kinloss in memory of their colleagues lost over Afghanistan a week earlier. Another reminder of losses in that theatre came in the form of the Royal Netherlands Air Force F-16AM display. Operational demands resulted in the withdrawal of the RAF Merlin HC.3 and Hercules C-130J displays, the latter also due to act as jump-ship for the Falcons, as well as no Jaguar or Harrier participation in the static line-up. Otherwise the RAF provided all of their current solo and team displays with the bonus of the Typhoon, T.1 a.m. and F.2 p.m., displaying twice to cover withdrawn aircraft. The Battle of Britain Memorial Flight made it to the show after two years of weather-induced cancellations but the Spitfire developed a fault and did not display although a civilian owned Mk.XVIII did fly earlier in the day. The only other UK military flying participation came from the Royal Navy Historic Flight`s Sea FuryFB.11 making a welcome return to Scotland especially as its predecessor had to be abandoned into the sea at a Prestwick show in the 1980`s. Ex-UK military warbird flying participation included the Spitfire as mentioned as well as Hunter, Vampire, Meteor, and Chipmunks. Overseas flying participation included the F-16AM from the Netherlands as mentioned above and from Belgium which also provided an Augusta A109BA. The Polish Air Force made what is hopefully the first on many visits to a Leuchars show with a MiG-29A flown by in an impressive display of raw power, noise and smoky Tumansky throttle changes which was later repeated to cover one of the cancelled slots. Another welcome first-time visitor to Scotland was the Czech Air Force Mil Mi-24V Hind which put up a similarly impressive although much quieter display. Yet another first-time visitor to the UK and providing a contrast to jet and turbo-charged piston engines was the Royal Danish Air Force Baby Blue Display Team flying four Saab T-17 Supporter , an aircraft type perhaps better known for bettering the jet equipped Nigerian Air Force in Biafra in the 1960s despite its small size. The static display enjoyed good international participation. As always the United States was well represented with a Barksdale AFB based AFRC B-52H , New Hampshire ANG KC-135R, McGuire AFB based KC-10 and pairs of F-15C and F-15E from the 48th FW at RAF Lakenheath. Pairs of F-16AM and BM from Denmark and Norway completed participation from the four original European operators of the Fighting Falcon. Denmark also provided a pair of AS550C-2 Fennec while Germany was represented by a Transall, F-4F Phantom and Tornado ECR. Although not flying this year the Irish Air Corps displayed a PC-9 while a Greek Mirage 2000BGM, Polish An-26 and Czech Mi-17 Hip and Mi-24V Hind made their first appearances at the show. UK static participation included a number locally based Tornado F.3 as mentioned including 56 Sqn.`s Firebird marked example, Tornado GR.4, 3 Sqn. Typhoon F.2 , E-3 Sentry, Firefly, Tutor, Tucano, Hawk, Dominie, Squirrel, Puma and Chinook along with a Jetstream T.2, Merlin HM.1 and Lynx HMA.8 from the Royal Navy and a locally based Army Gazelle AH.1. Civilian operated Falcon 20 from FRA along with warbirds such as the Jet Provost, Omani marked Strikemaster, Nord 1101 and S.E.5a, Tiger Moth and Bulldog were also displayed. Barrier placement ranged from an excellent balance around the usual USAF "citadel" allowing clear viewing for casual visitors and enthusiasts to being far too close around the "fast jet" line-up along the north taxiway frustrating both the general public and photographers. Consequently many of the static participant photographs were taken during the arrivals on Friday as part of the organised Enthusiast Package. For the second year the static display ran continuously from the main ramp along the north taxiway but this time with most of the traders stalls established on the opposite side of the taxiway from the displayed aircraft rather than beyond them which seemed to work very well. Again the crowd line extended further westwards along the length of the runway allowing better views of the display aircraft ramp and taxiway. While security was obvious it was proportionate and created few problems for the public while traffic clearance afterwards was normal for Leuchars, internet complaints to the contrary seemed mainly to come from first-time visitors failing to grasp the well known limits imposed by local geography and traffic infrastructure. In summary, congratulations to both organisers and station personnel for an excellent show. There will be no Leuchars Airshow in 2007 because of runway resurfacing but with such a high level of established expertise 2008 is keenly anticipated - what is the chance of an Tornado F.3 / Bear intercept and flypast?